Students at UCLA Community School prepare for graduation. The school has boosted the college enrollment rates of its congressional district from 34 percent to 86. College wasn’t always a given for Jeffrey Hayes. A child of immigrant parents, he attended poorly performing public schools in South Los Angeles, and never expected his education to go beyond high school. That all changed when his parents heard from other family members about the UCLA Community School, and decided to relocate to Koreatown so they could enroll their son at the university-partnered public high school. In that new environment, Hayes found a community that was invested in his academic success, and he began to see his future in a different light. Now a senior at UCLA who is applying to master’s programs in education, Hayes’ life is on a completely different trajectory. The UCLA Community School is one of five public schools dotting California that are run as partnerships between a UC campus and a local district. 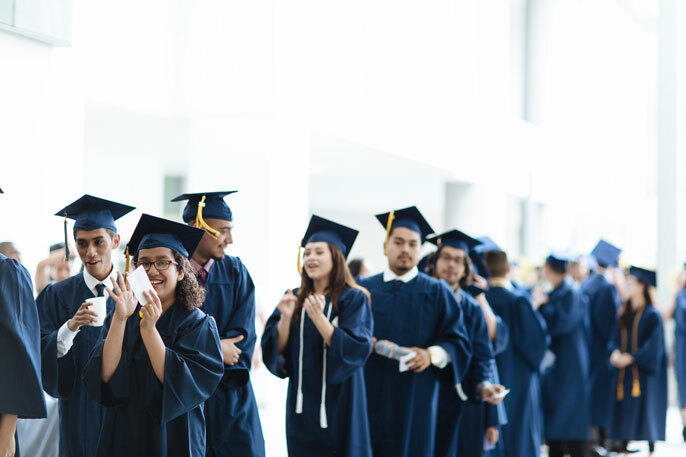 They all share a common aim: to improve the academic achievement of students who face barriers to college, with a focus on serving communities that have been historically underrepresented within higher education. These partner schools not only nurture the college aspirations of students who might otherwise be shut out of California’s best universities; they also serve as a training ground for future teachers and school administrators, helping elevate the skills in classrooms across California. As such, the partner schools provide a positive feedback loop that enriches the academic landscape of the state from the ground up. The Preuss School, which is run in partnership with UC San Diego, opened in 1999 and now serves approximately 850 students in grades six through 12. Gompers Preparatory Academy, also run in concert with UC San Diego, opened in 2005, and now serves more than 1,000 students in grades six through 12. UC Berkeley’s Aspire California College Preparatory Academy (CAL Prep), is an eighth through 12 high school that opened in 2005, and has a total enrollment of about 300 students. UCLA partners with two schools in Los Angeles, the UCLA Community School, a K-12 school with an enrollment of 1,000 that opened in 2009; and the most recent partner school, Mann UCLA Community School, which serves students in grades six through 10 and opened in 2017, building on the legacy of an historic middle school. That’s not to say that there aren’t significant challenges in running these schools, including how to address long-running problems, such as tracking students and coordinating the supports needed for all students to succeed. To combat these and other issues, UC-partnered schools often dispense with traditional models so they can test new approaches on everything from curriculum development to student discipline. The Preuss School, for example, offers college-preparatory classes only — many of which are Advanced Placement courses that help students be more competitive in the college admissions process. To help students with this intense academic workload, students have a school year that is 18 days longer than students at other district schools. Some UC-partnered schools offer a curriculum that focuses on STEM-heavy courses like computer science, culturally-relevant ethnic studies classes and in-depth seminars that provide students with exposure to the kinds of courses they will experience at college. UC-partnered schools also frequently offer support that extends beyond the last bell of the school day. Students are provided with enrichment opportunities and after-school instruction, including Saturday School, an “8th period” for homework, and the ability to repeat courses. Students frequently receive tutoring and mentoring from recent graduates, who can share their college experiences. The schools also try to take some of the stress out of transitioning to college by providing their high school students the opportunity to audit college courses and earn college credit by enrolling in community college courses or participating in classes and labs led by professors and graduate students from the partnering UC campus. For Hayes, that experience all added up to a strong vote of confidence in his academic abilities. In 2009, the year the UCLA Community School opened, only 34 percent of high school graduates in the school’s congressional district enrolled in college. By 2017, this number was up to 86 percent, with 61 percent of graduates attending four-year colleges. Perhaps more impressive, the percentage persisting in college is 16 percent higher than the state average. Students at the community schools run in partnership with UC Berkeley and UC San Diego have also thrived. Every single student in the first two graduating classes at CAL Prep went on to college. In fact, more than 70 percent of CAL Prep’s last eight graduating classes have matriculated to four-year colleges and universities, while UC San Diego’s Preuss School graduated over 95 percent of their students in 2017 and 2018. Quartz attributes those retention numbers to the school’s culture. There are high levels of collective responsibility and trust among the faculty, she said. The Community School’s high teacher retention rates also reflect hiring committee practices that are more inclusive and democratic. The result is a highly qualified faculty, she said: Nearly 70 percent of the school’s teachers hold a master’s degree, 20 percent are certified through the National Board for Professional Teaching Standards, and roughly half are UCLA alums. Teachers are also more racially diverse at the Community School, relative to rest of the district and state. The overwhelming majority of the faculty is bilingual, allowing them to better connect with some of their students. Assessing which new teaching techniques at UC-partnered schools work well and which don’t is providing valuable data for improving teaching practices around the state, enhancing ongoing collaborations between California’s k-12 schools and its universities, and offering research opportunities for both graduate and undergraduate students at UCLA.